Lucasfilm has released a brand new trailer for the second half of Season Two of Star Wars Rebels. Check it out below! Wow! There's some amazing stuff in there, but it doesn't get any bigger than Ahsoka vs Vader. That's going to be a showdown for the ages. Also, it's great to see Cham Syndulla, Yoda(in the flesh this time! ), a new Inquisitor, Anakin Skywalker and... was that Darth Maul? So much to take in and process. Keep it here on the SWU as we will be breaking down the trailer on a new episode of "Live From Lothal" coming up later this weekend. 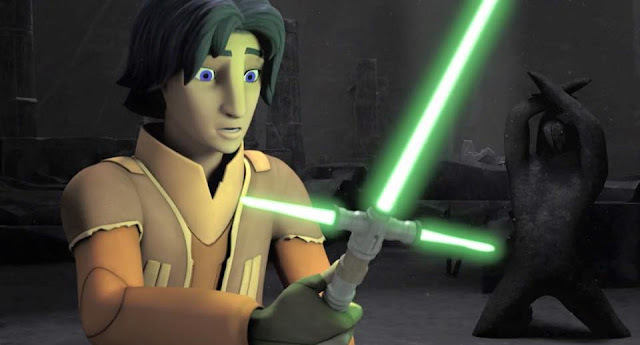 Star Wars Rebels returns on January 20th at 9pm with "A Princess on Lothal" on Disney XD. Has Vader's mask changed to match the OT more faithfully? i don't want ahsoka to die ! I don't think my emotions can handle this. I'm still recovering from TFA. OMG!! This trailer was crazy! disney is on crack making this harder and harder to connect to the OT cleanly. maul perverts ezra? ezra has a crossaber? ezra meets and interacts at length with leia? they better know what they're doin!! Ahh plug in won't work..
none of it has to connect to the OT. It is not the same story line. Our, where do you people come from ? Rebels is canon, so all of what's happening in the show is connected to the OT and the prequels and the new trilogy. Just sit back and enjoy the stories. Don't get so desperate to hang on to every tiny detail. This half of the season looks like it will be better than the first. I can't wait to get into the meat of the story. Also, a stable crossguard saber. That looks AWESOME. were do you think you see darth maul? sure it has to connect to the OT. not in a simplistic, explicit way like how the end of RoTS did... but how would Ezra and Kanan have heroically helped get the Rebellion up on its feet and running without it having a lasting effect on it, at least, in ANH? Especially having now met Leia? It obviously doesn't have to make any sense for it to still be good, that isn't what I meant. My point was simply that by making a lot of connections too quickly (if that indeed is Maul, for example. whatever it is they plan on doing with ahsoka. ), you leave a lot of room for erroneous retconning unless very careful. They're really upping the stakes is all. I'm sorry but I just don't get all the hype about this show. The last good animated Star Wars series was Tartakovsky's Clone Wars. Before that...Droids. Thank you! I agree wholeheartedly. Are you saying that "Old Master" is Maul? If not, who do you conjecture IS Old Master? Ezra can't be snoke. ... unless they recon some stuff in the future... I mean ezra was invented long before snoke was even considered as a male. ... he wasn't even given a final appearance till October last year and was almost a woman. Personally I think ezra may become one snokes first apprentice. .. he had at least one before ren. I don't understand what all the complaints are about. The animation pays homage to McQuarrie's design while giving a nod to Disney. It lacks the hard, angular design of the "Clone Wars" series (which went a LONG way towards redeeming the prequels IMO), but when you focus on Rebels, it doesn't lack for detail. I was six years old when "A New Hope" debuted, and as a child the wait for a new film was unbearable. Then there was an eternity where the stories were believed to be over. Now we are given the promise of an almost endless flow of content and people are complaining because it's not exactly what they would have wanted. Spoiled. Spoiled rotten.